The Panhellenic Council won the Outstanding Circle of Sisterhood Award at the Coalition for Collegiate Women’s Leadership Conference (CCWL) Feb. 21-23 in Atlanta. In addition, Panhellenic executive council members Kayla Ditto (Phi Mu) and Bella Tawasha (Kappa Delta) placed third in the Order of Omega Case Study Competition. 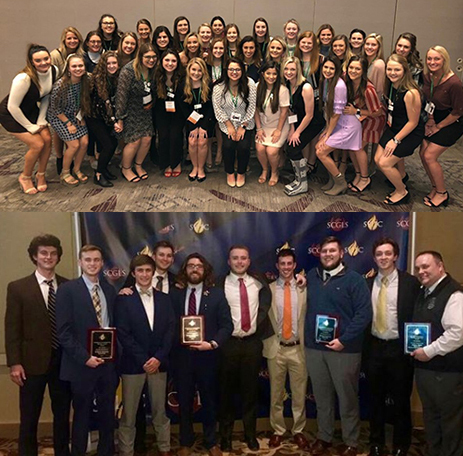 The InterFraternity Council won the Excellence in Outstanding Academic & Scholarships Programming, Excellence in Outstanding Service Project and Excellence in Outstanding Recruitment Award at the Southeastern Interfraternity Conference (SEIFC) Feb. 21-23 in Atlanta. Advisor Andrew Rash won the Dr. Tom Shoemaker Award for Advisor of the Year. In addition, IFC executive council members Kody Okert (Kappa Sigma) and Will Downey (Phi Delta Theta) placed third in the Order of Omega Case Study Competition. The CCWL and SEIFC conferences host Panhellenic and IFC councils from schools all over the country.